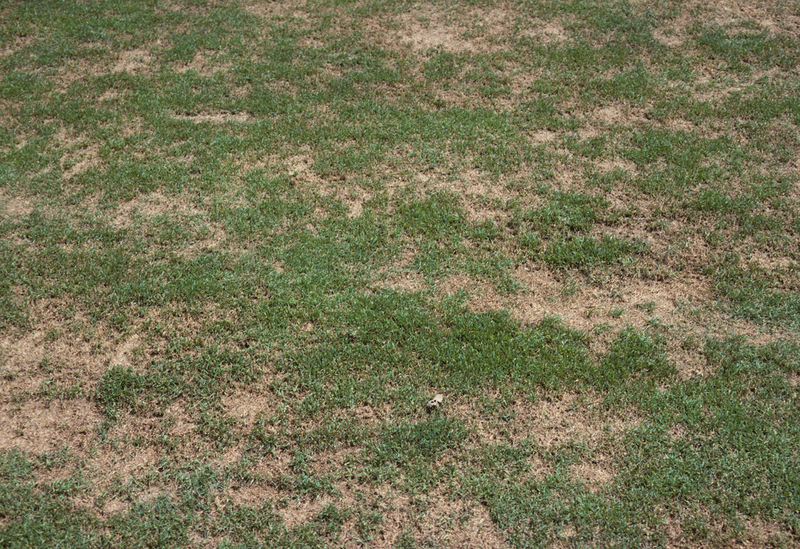 Brown patch caused by Rhizoctonia solani is the most widespread of all turf diseases occurring throughout the world and attacking all known turfgrasses. 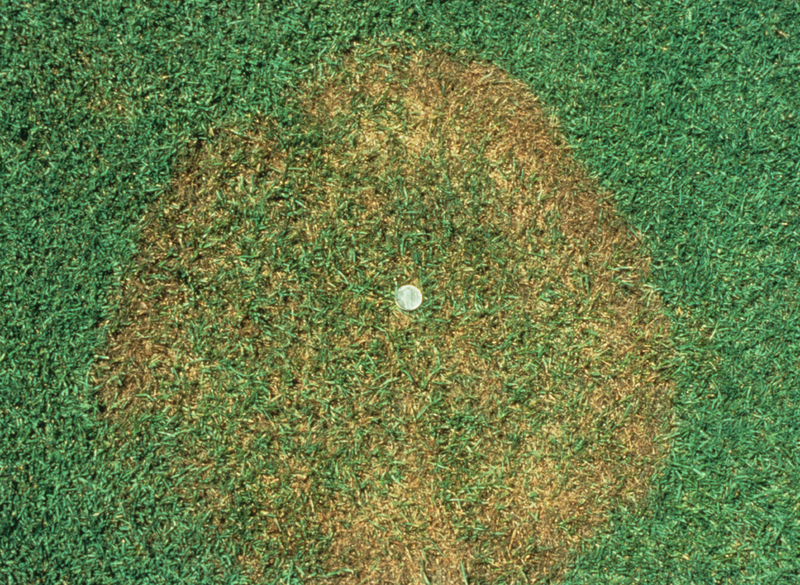 The disease appears as blight in circular patches ranging in size from a few inches to several feet. Infected leaves appear water soaked and dark, eventually drying and turning brown. Brown to black sclerotia are sometimes found beneath the leaf sheath or on the crowns. When humidity is high, a dark-purplish to grayish brown border ("smoke ring") may appear at the margins of affected turf, especially on close-cut turf. If conditions remain conducive to disease, large areas may rapidly become infected. Leaves in blighted area are usually killed, however a return to cooler weather or fungicide applications enable regrowth from surviving crowns, stolons, or rhizomes. R. zeae and R. oryzae cause leaf and sheath spot of bentgrass, centipedegrass, and St. Augustinegrass. Symptoms vary with turfgrass species and cultivar, the Rhizoctonia species or strain, soil conditions, and the environmental conditions. 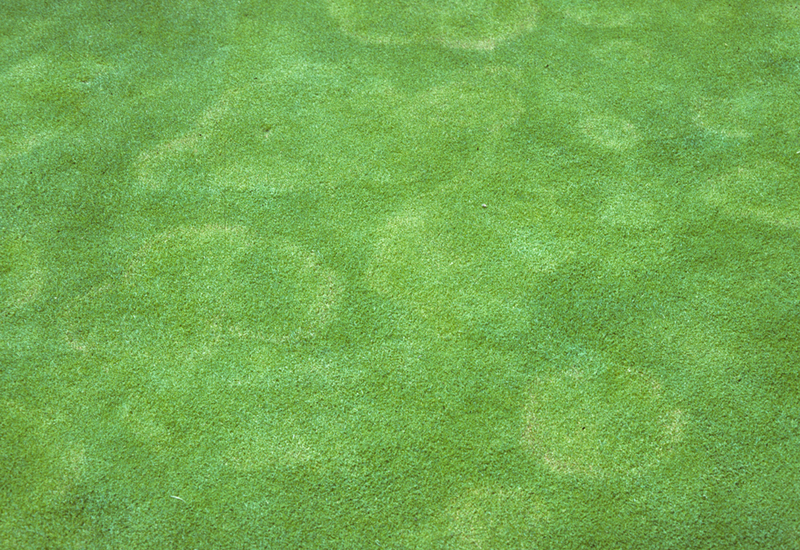 Yellow patch (cool-season brown patch) caused by R. cerealis affects mostly cool season grasses and causes yellow rings, arcs, or patches on closely mowed grasses. The main hosts are bentgrasses, bluegrasses, and ryegrasses, but the disease has been reported on bermudagrasses and Zoysia species. Numerous rings may be interloped or uniformly distributed. The pathogen is mostly a foliar blighter, but under conducive conditions, it can invade the crown and cause plant death. yellow patch is favored by extended periods of overcast, rainy, cool weather, poorly drained soil or thatch, and poor air circulation. R. solani and other Rhizoctonia species are natural inhabitants of the soil. R. solani becomes active when soil temperatures reach into the 60s, but does not parasitize the grass until air temperatures rise into the mid-80s with high humidity and nighttime temperatures in the 70s. When the grass plant suffers heat stress and high temperature growth cessation, disease development progresses rapidly. Dense, highly fertilized, and frequently watered turf is most susceptible to infection. R. cerealis infection process is similar, but with lower temperature requirements (50-65° F). R. cerealis generally does not require fungicide applications, the turfgrass recovers with warmer temperatures and sunny weather. Avoid excessive nitrogen applications. Slow release forms of nitrogen are beneficial. Improve subsurface and surface drainage. Reduce leaf wetness by manual removal of dew. Improve air circulation and light penetration by pruning trees and shrubs. Mechanically remove thatch if it accumulates to more than one half inch. In the case of brown patch, it is often helpful to use weather-based forecasting models to time fungicide applications. A curative fungicide program during the summer stress period is not recommended because disease development is rapid and the ability of the turf to recover is limited.